Ensures high availability for the most widely used transactional data stores for cross site workload balancing and for disaster recovery. The IBM Data Replication CDC technology Management Console is a Java®-based and rich client interface providing access control, configuration, operation and monitoring. It is also available as a command-line interface. Multiple Management Consoles may be concurrently active for the same system, allowing a team approach to both developing and controlling a replication system. InfoSphere® Data Replication can be used to implement integrated systems and keep those systems updated immediately as changes occur, eliminating redundant data transfer, all while minimizing the impact on production systems. Instead of using triggers or performing queries against the database, IBM Data Replication software reads the native database log to capture changes. 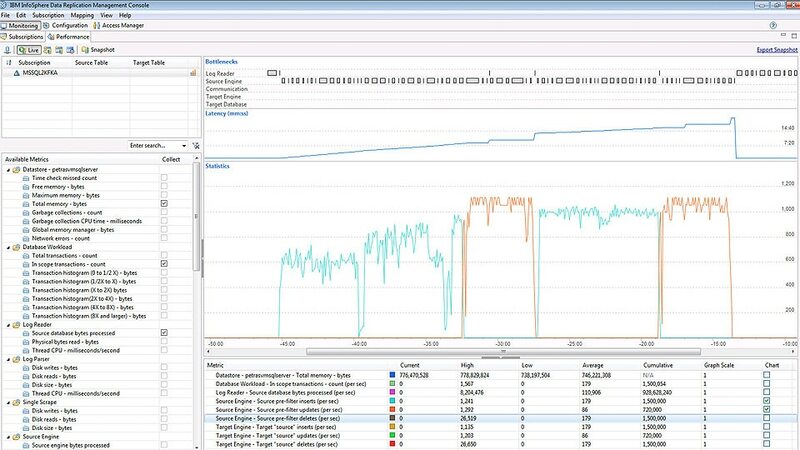 For businesses faced with shrinking batch windows or over-utilized applications, this log based change data capture approach helps ensure the performance of even the most demanding mission-critical applications running on the source system is not adversely affected. IBM® Data Replication supports high availability, database migration, application consolidation, dynamic warehousing, master data management (MDM), service-oriented architecture (SOA), business analytics and extract-transform-load (ETL) data quality processes. It delivers capabilities for loading real-time information into a data warehouse or operational data store, which can help organizations enhance business agility and visibility into key processes. IBM Data Replication for IBM Z supports Db2 for z/OS , VSAM and IMS while IBM Data Replication for Distributed and Cloud platform products support DB2 for Linux®, UNIX®, and Windows®, Db2 iSeries, Db2 Warehouse, Db2 Warehouse for Cloud, Db2 Hosted, IBM PureData® for Analytics, IBM Integrated Analytics System, Cloudant®, IBM MQ, Informix®, Oracle, Exadata, MySQL, SAP Sybase, Teradata, PostgreSQL, Kafka, Hadoop, Microsoft™ SQL Server, and the Azure SQL Database. IBM Data Replication provides a comprehensive solution for dynamic integration of Db2® z/OS® transactional data via near real-time. The solution includes incremental delivery of transactional relational data captured from database logs, including Kafka and Hadoop. New remote capture source engine for Db2 z/OS sources provides a second operational model for capturing changes that helps reduce z/OS MIPS when needed to replicate Db2 z/OS data. Gain access to the unified governance and integration platform offerings via flex point licensing. It supports your rapidly evolving business needs by giving you flexible access to the offerings included in the platform. Purchase entitlement based on your expected needs. When your business requirements change, gain the flexibility to add or stop using a product and apply the same flex points to another offering within the platform, as long as you stay within total flex points purchased.